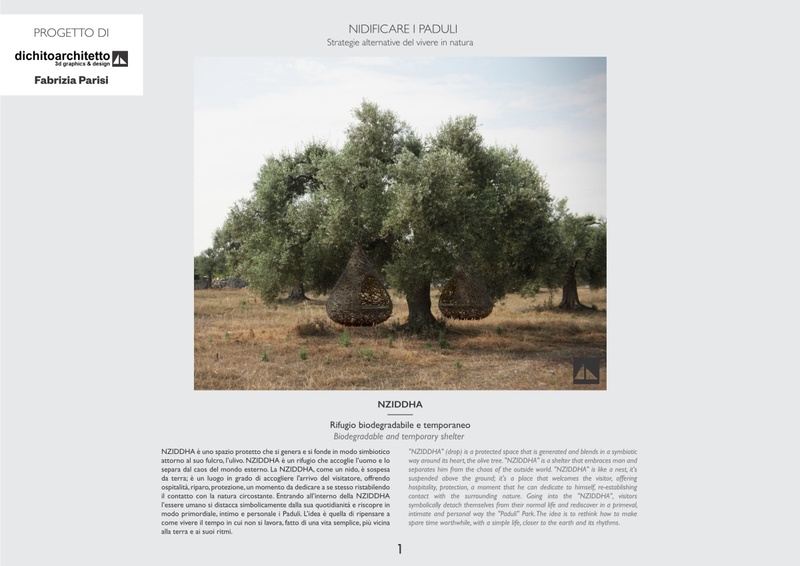 Nziddha winner of ideas contest "Nidificare i Paduli 2015"
“NZIDDHA” (drop) is a protected space that is generated and blends in a symbiotic way around its heart, the olive tree. “NZIDDHA” is a shelter that embraces man and separates him from the chaos of the outside world. 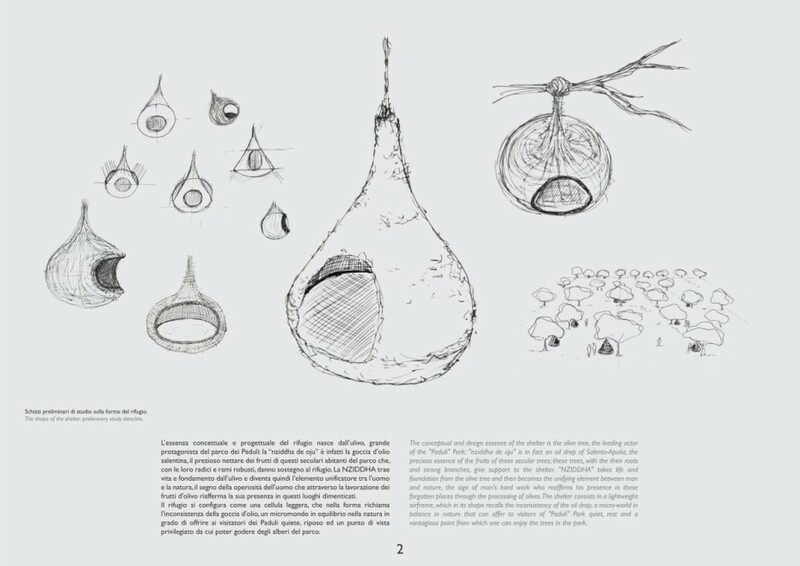 “NZIDDHA” is like a nest, it’s suspended above the ground; it’s a place that welcomes the visitor, offering hospitality, protection, a moment that he can dedicate to himself, re-establishing contact with the surrounding nature. Going into the “NZIDDHA”, visitors symbolically detach themselves from their normal life and rediscover in a primeval, intimate and personal way the “Paduli” Park. The idea is to rethink how to make spare time worthwhile, with a simple life, closer to the earth and its rhythms. 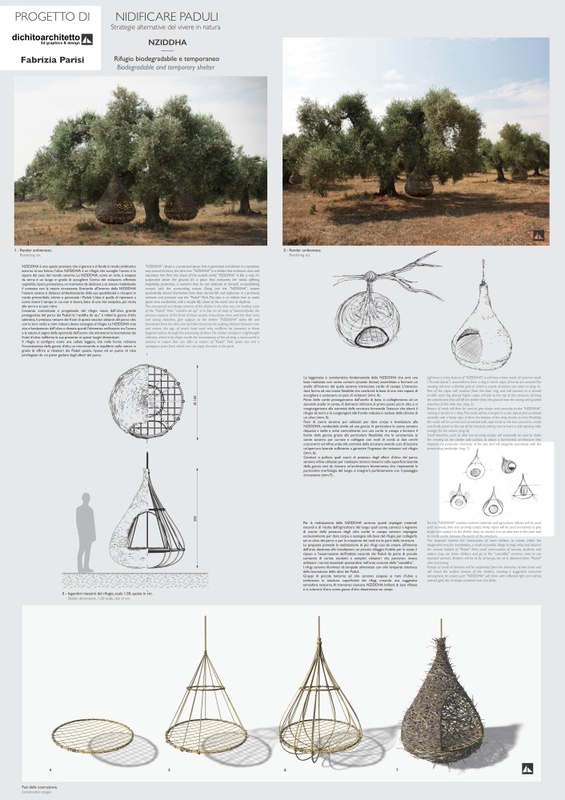 The conceptual and design essence of the shelter is the olive tree, the leading actor of the “Paduli” Park: “nziddha de oju” is in fact an oil drop of Salento-Apulia, the precious essence of the fruits of these secular trees; these trees, with the their roots and strong branches, give support to the shelter. 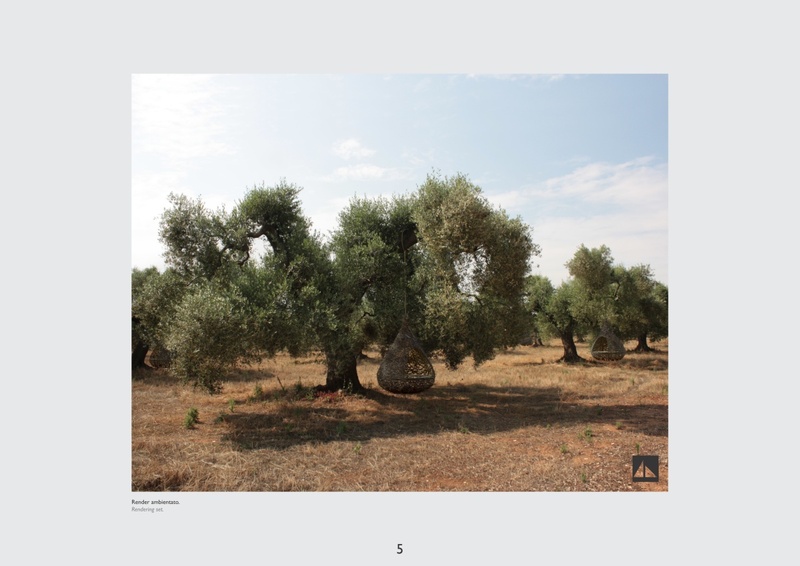 “NZIDDHA” takes life and foundation from the olive tree and then becomes the unifying element between man and nature, the sign of man’s hard work who reaffirms his presence in these forgotten places through the processing of olives. The shelter consists in a lightweight airframe, which in its shape recalls the inconsistency of the oil drop, a micro-world in balance in nature that can offer to visitors of “Paduli” Park quiet, rest and a vantagious point from which one can enjoy the trees in the park. Lightness is a key feature of “NZIDDHA”; it will have a base made of common reeds (“Arundo donax”) assembled to form a ring in which ropes of hemp are weaved. The weaving will form a flexible grid on which a couple of visitors can relax on. Part of the ropes will continue from the base ring, and will connect to a second smaller reed ring, placed higher; ropes will join to the top of the structure, forming the attachment that will lift the shelter from the ground near the strong and gnarled branches of the olive tree. Beams of reeds will then be used to give shape and convexity to the “NZIDDHA”, making it similar to a drop. The reeds will be arranged in a star layout and combined centrally with a hemp rope to form the bottom of the drop; thanks to their flexibility, the reeds will be curved and connected with rope knots to the two concentric circles and finally joined at the top of the structure, taking care to leave a side opening wide enough for the visitors. 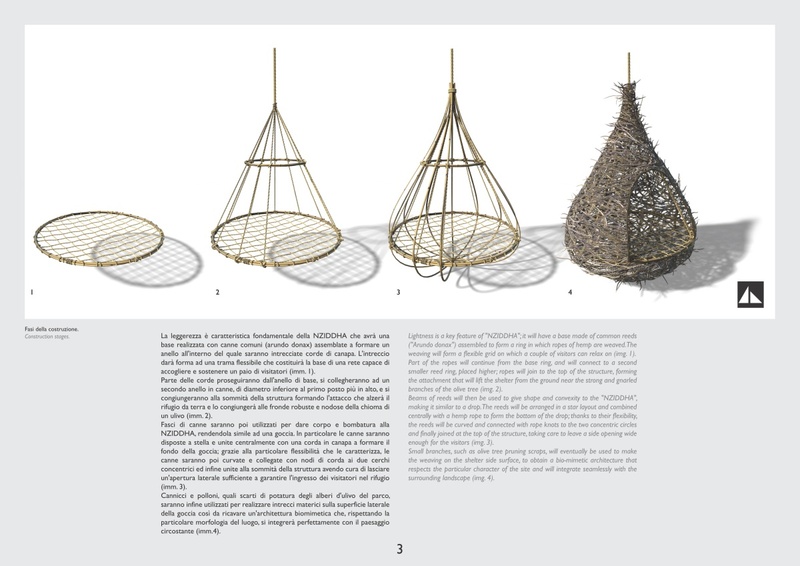 Small branches, such as olive tree pruning scraps, will eventually be used to make the weaving on the shelter side surface, to obtain a bio-mimetic architecture that respects the particular character of the site and will integrate seamlessly with the surrounding landscape. 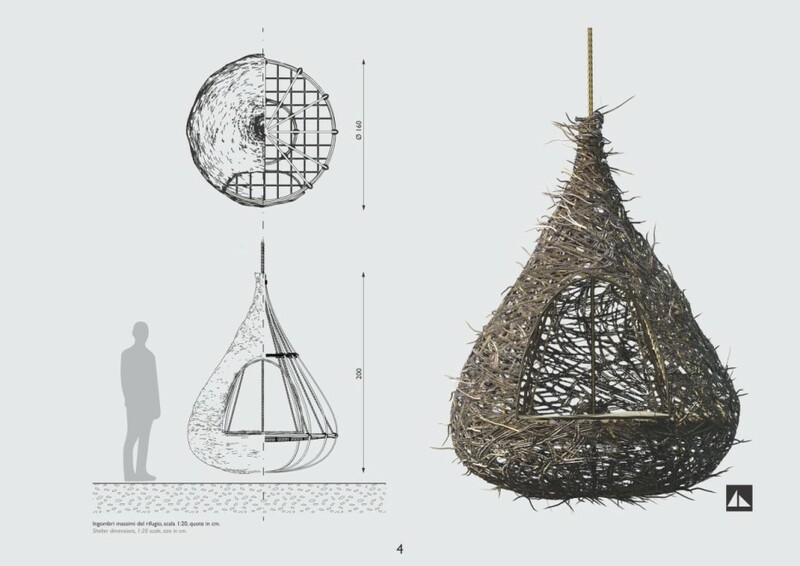 For the “NZIDDHA” creation, natural materials and agriculture refuses will be used, such as reeds, olive tree pruning scraps; hemp ropes will be used exclusively to give shape and support to the shelter base, to connect it to an olive tree in the park and to create nodes between the parts of the structure. The proposal involves the construction of more shelters to create, within the designated area for installations, a small accessible village to stop, relax and observe the natural habitat of “Paduli” Park; small communities of tourists, students and visitors may use these shelters and go to the “caseddha” common area to use essential services. Shelters will be lit by oil lamps; the oil is obtained from “Paduli” olive processing. 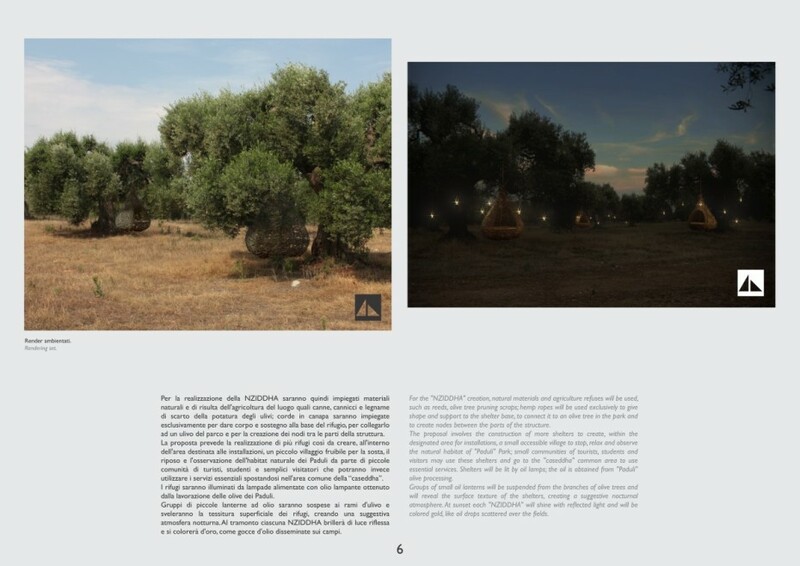 Groups of small oil lanterns will be suspended from the branches of olive trees and will reveal the surface texture of the shelters, creating a suggestive nocturnal atmosphere. At sunset each “NZIDDHA” will shine with reflected light and will be colored gold, like oil drops scattered over the fields.